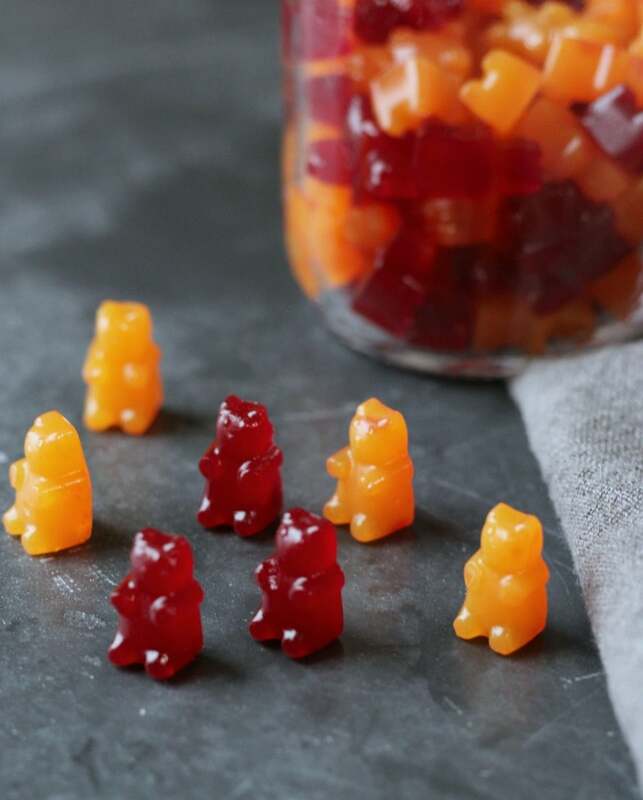 Gummy Bears Multivitamin; this Vegan and Gluten-free recipe for an all-natural flavored gummy multivitamin that are gelatin-free and sugar free. A gentle solution to enhance your family’s health and wellness with very little cost! Some eight years ago when I made the smartest decision of my life and dove back into my roots, leaving behind all the young-adult experimenting living la vida solo in a brand new Country, meant more then perhaps a new phase I was going through. It meant that I was growing up and getting real with life. I knew this choice would take me on a journey of trials and errors, successes, learning but most importantly, finding myself again. The first time I set foot at a Whole Foods Market, I felt completely lost. With a couple of deep breaths I made my way through the store, getting familiarized with some overwhelming amount of information, brands I never heard of, ingredients I wouldn’t cogitate to try, and prices that were far above my comfort level, at that time. I was so incredibly fascinated and eager to learn everything in the whole body department, especially on the Vitamin shelves. There was a such hunger in me to get familiarized with as much as possible so I could help myself and my family, fast! However, there was little I could do at the time, given a recent divorce and caring for two young children. So I had to run a turtle race, but as you probably know the story of the tortoise and the hare, slow and steady steps will get you where you need to be, and although I do not, listen up… I DO NOT claim to be a specialist, I did learn a thing or two… oooh fine! 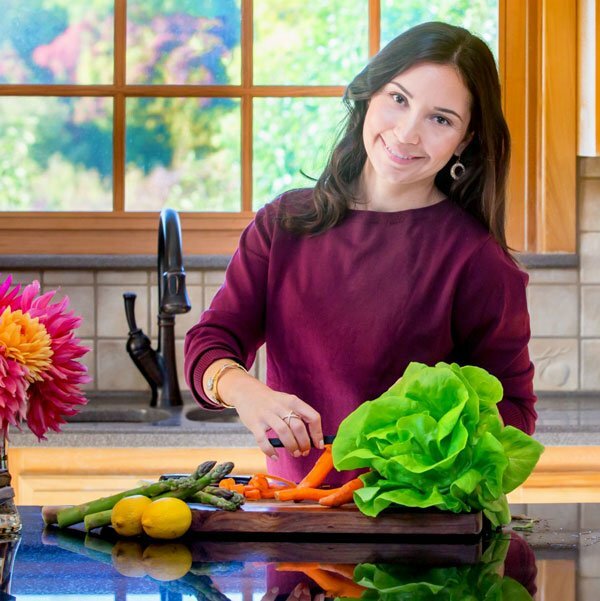 I learned A LOT over the past eight years of diving into the food and health industry. Okaaaay, it’s about time I present to you my latest recipe. Yep, a rather unusual recipe indeed BUT one that I hope will help you, should you find yourself on a tortoise race against prices, brands, lack of options, quality and in case you are hoping to find the perfect balance between the very important choice to put quality Vitamin into your little one’s mouth at a price you can afford, here is my eight year contribution to you smart Mommies (and Daddies, off course!). First things first! You will need to purchase a high quality Vegan and Gluten-free multivitamin like this one here. I am not associates with this brand and you are more then welcome to do your own research and find a brand you like. This large bottle will allow you to make several batches of gummy bears multivitamins, and will undoubtedly save you a lot of money! Believe me, my children are teens now and the shape is still a big deal to them! This is a small investment which will be paid off almost immediately! I’ve done the research and I can assure you that the prices of a good quality all-natural vegetarian and gluten-free multivitamin bottle is quite sour! Lastly, you will need agar agar powder! No typo here, there are two (2) agars for whatever reason… Lol. This is a natural Vegan-Vegetarian source of gelatin. Unlike Gelatin which is made from animal collagen, agar agar is a natural vegetable gelatin. With these three key ingredients in hand, you are set to make thousands of Gummy Multivitamins and never spend a penny on overpriced Vitamin again! 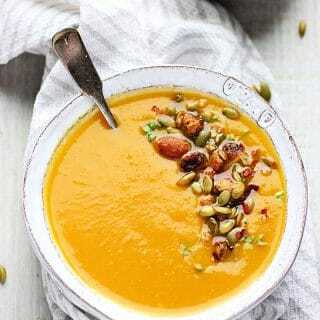 The recipe itself is very easy and simple. When I made my family’s Gummy Vitamins I wanted them to be colorful and pretty, cuz by now you know that my job is to make food look pretty and irresistible, even Vitamins! So I choose to make red gummy bears from beet juice and the orange ones from pure carrot juice. However the choice is yours, and isn’t this the funnest part anyway? So please find the flavor your little one will enjoy or use mine as a template. Oh, and one more thing before you go… remember these are vitamins, not candy. So please read the multivitamin label for suggested dosage and adjust the recipe accordingly. My recipe allows for up to 10 gummy vitamins a day for a month supply, however you can make the adjustments that works best for you! 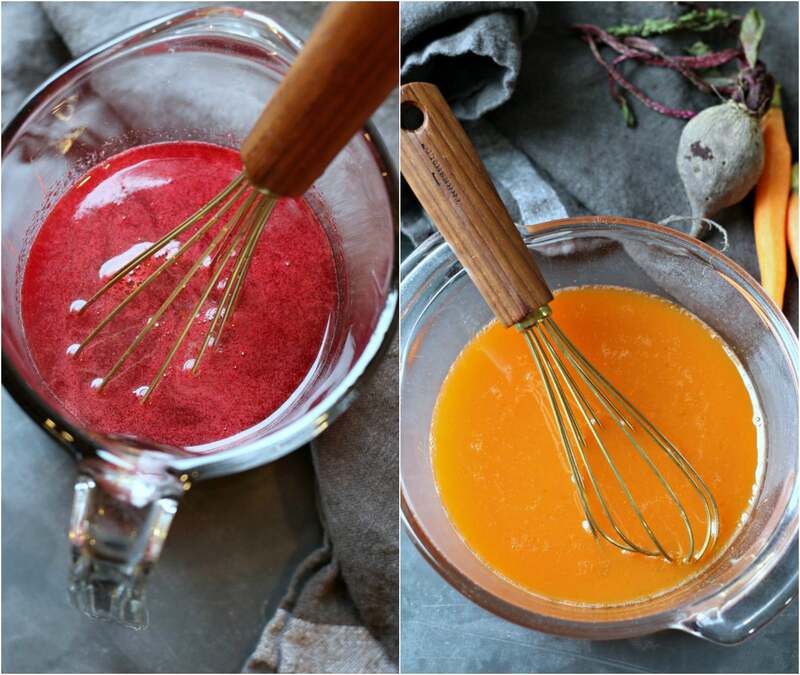 In a blender add the carrot (or beet, one flavor at the time, same process!) water, maple and blend. Using a fine mash, strain the concentrated juice into a glass bowl. Add the multivitamin and agar agar powder and whisk to combine. Set aside for 5 mins while you work on the next flavor. 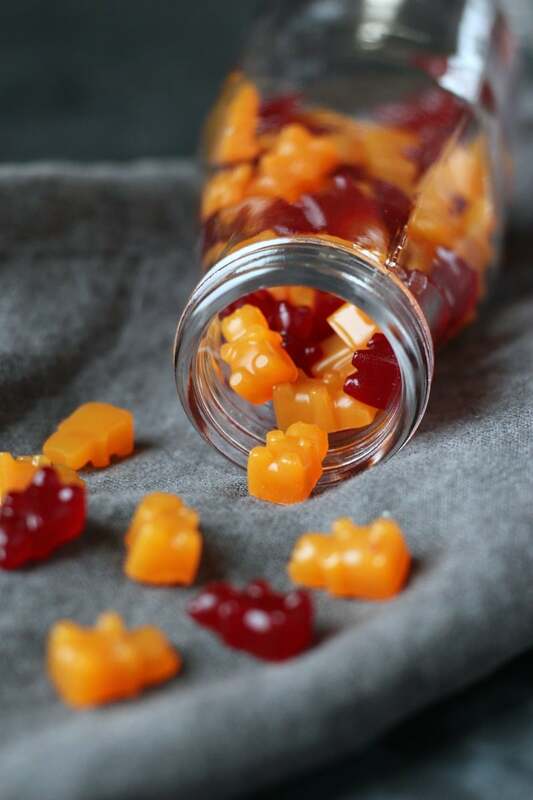 Remove from heat and pour into the gummy bear mold using the dropper (which comes included with the gummy bear mold). Refrigerate for 2-3 house to set. Remove from mold and store them in a jar. Keep refrigerated. This recipes makes about 300 gummy multivitamins, however the mold only holds 100 at the time. Choice 1. buy 3 pk gummy silicone mold, which I didn't. Choice 2. pour remaining liquid multivitamin into a flat shallow glass container and when set, cut into small cubes. This worked just fine! 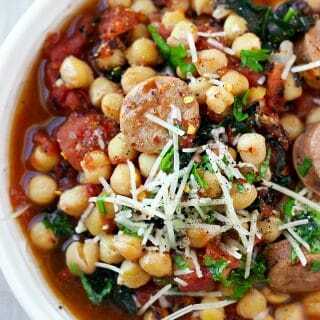 If you enjoyed this recipe, I only ask that you pay it forward by sharing with your family and friends. By doing so, you are supporting my work to continue to inspire you to find better ways to feed you family. This is AMAZING! I’m so glad I found your recipe. My kid … and my husband are both crazy about gummy bears but since we changed our diet and we don’t consume store bought sweets, they can’t enjoy in sweet bears anymore. Until now 🙂 I’m pinning this and saving to try. 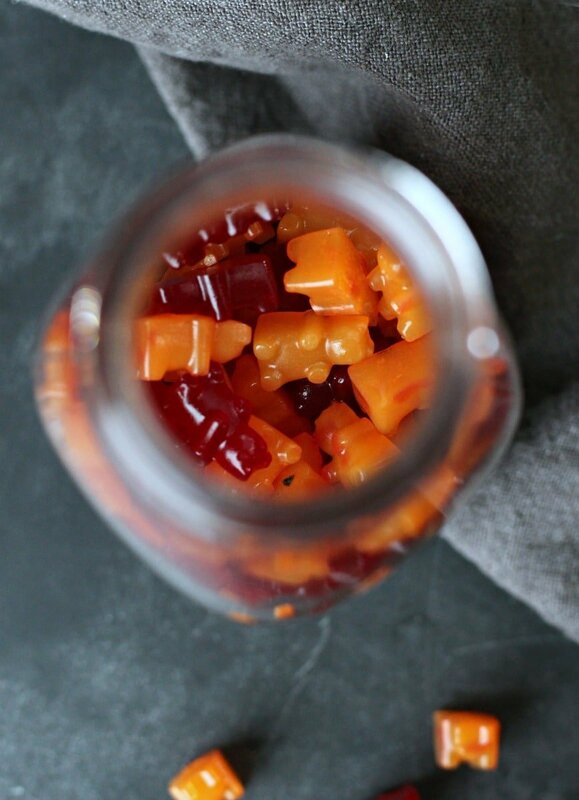 They will be thrilled when I make them this healthier gummy bears. OMG what an interesting recipe/post. First off…totally love the little gummy bear mold. 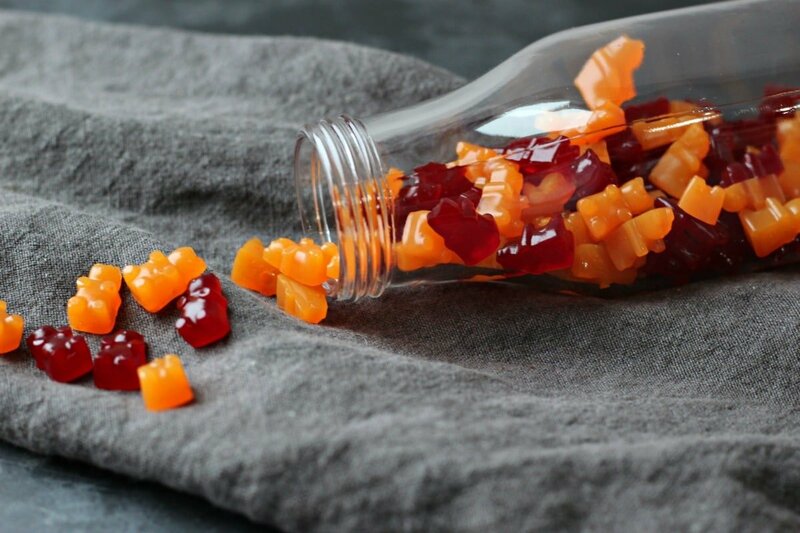 I would never have thought of making gummy vitamins….like ever!! This is a great option if you don’t want to use store brand vitamins….really cool!! Exactly Stephanie, its nice to be able to control what’s in my kids’ vitamins! I am speechless. I really didn’t even think about making your own vitamins. I’m past the time when my kids are home and using vitamins but I can certainly see the benefits of all natural and high quality. And the mold is adorable! I bet any little one would eat the vitamins without hesitation. My kids would FLIP for these and I love how natural they are for them. And that gummy bear silicone mold, totally ordering it! Too cute! That’s awesome, so glad Megan! This is fantastic! I .. um.. love gummy vitamins. I absolutely refuse to buy them though, because they’re always full of sugar and corn syrup!!! (I’m pretty sure that’s not “healthy”). This is such a great idea! Thanks for pointing out about the two agars in that ingredient. Too easy to slip up. Thanks Noel, the shape definitely makes it fun! this is BRILLIANT!!!!!! I HAVE to get one of those molds and make it. My kids will love me until the end of times!!! First of all, I think EVERYONE needs a gummy bear silicone mold! 🙂 These are so cute! I’m a huge fan of gummy bears though I must admit I eat more candy than vitamins (yikes). These are awesome, kids won’t even realize they’re eating healthy. Exactly Jolina, they get so wrapped up with the shape and cuteness and don’t realize it is pure vitamins! and you can definitely keep the vitamin out and just make candy instead… healthier candy too!! This is amazing! I am so impressed you figured out how to make vegan gummy vitamins! You could start your own vitamin business. People would totally buy these! 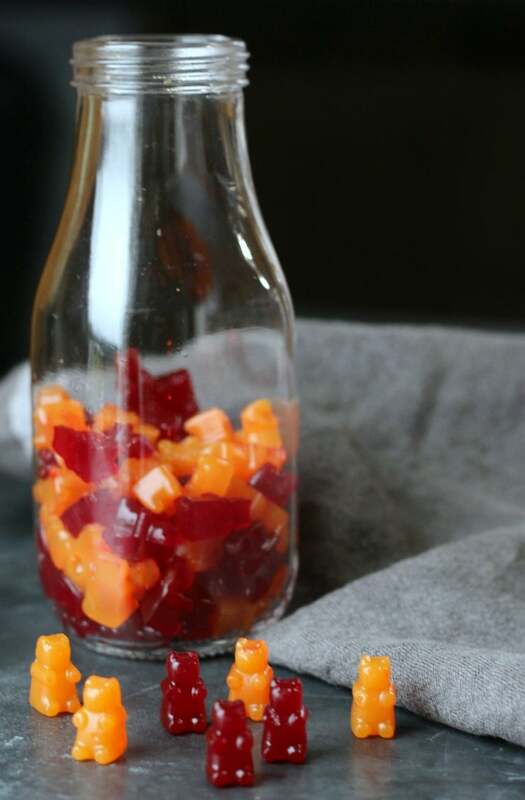 These are cute gummy bears multivitamins, I like this recipe because we know what is in that instead of store bought ones with 1000 of ingredients written in small letter which even hard to read as well as for understanding the names you need entire day to google it. Hahaha, I know right?!! It’s why I love making our own. It’s easier, cheaper, safer and fun to make! Seriously, you are Amazing!! 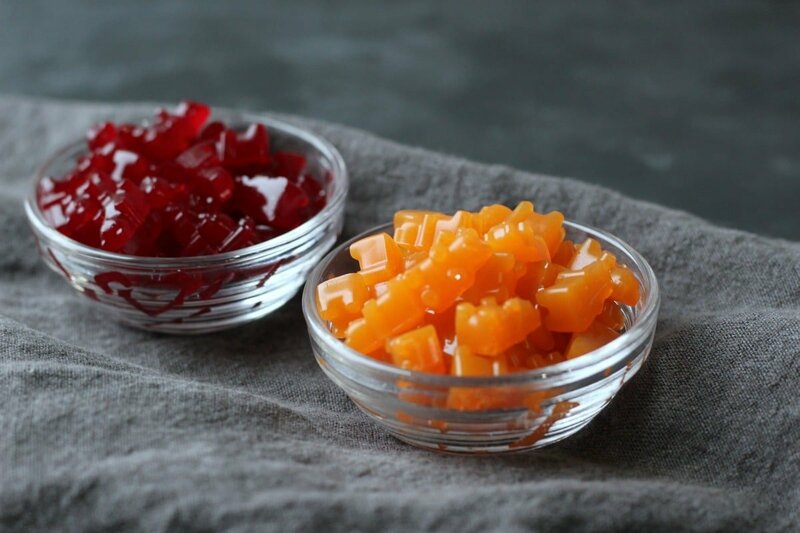 You made gummy multi-vitamins at home and they look so pretty. First of all, I didnt even know you could make them at home and second, those gummy molds look so cute. That is correct Byron, you are only limited to a few a day. However, you are certainly welcome to keep the vitamin out and just make candy 🙂 Thanks so much! These are so cool! I love that they are vegan. I’ve been a vegetarian for most of my life, and finding veg vitamins can be challenging. I bet these are really tasty too. Oh, and I love that little bear tray – I need to get one. Yep, fining vegan gluten-free vitamin isn’t the easiest thing and when you do find, they are rather expensive. Thanks for your kind note! 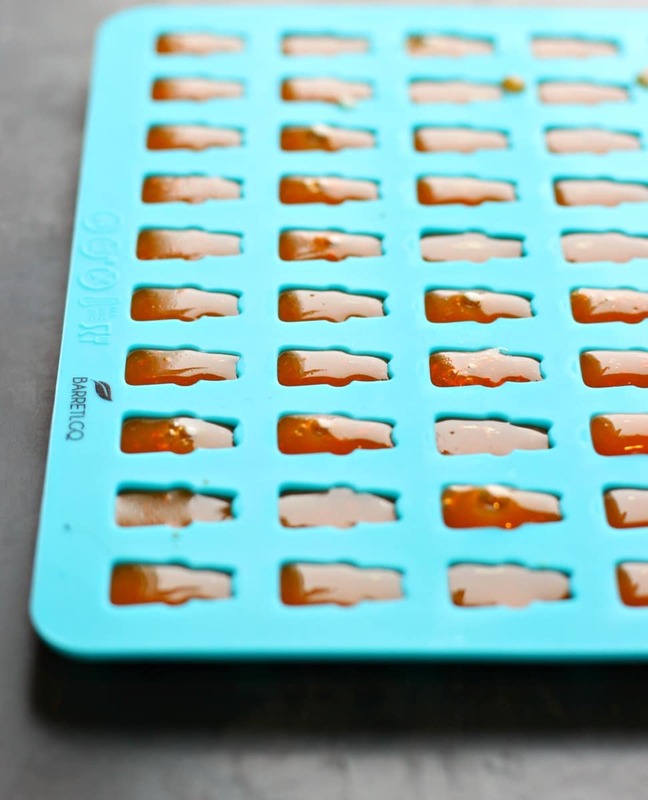 I love the idea of making my own vitamin gummies. I buy some for the kids all the time but I am always skeptical of the additives they put in them. I will have to wander around whole foods for a while (there are worse ways to spend your time lol) and find some liquid multi-vitamin mix. Hm I love spending time at Whole Foods, whole body department, there is always something new to learn 🙂 Thanks so much Jen! I love, love, love the idea of homemade multivitamins! But is it correct that you use 3 tablespoons of the liquid multivitamin in each batch? 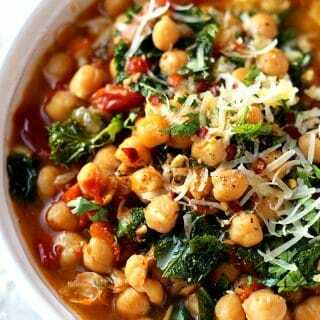 For the product you use, a serving size is 1 tablespoon of vitamin. So each batch of gummy vitamins in theory is only three days worth of your vitamin serving. That’s a LOT of gummies to eat! Can you replace the water with more liquid vitamin to get the number of gummies you have to eat a day down? So, if you take away half the water. Then they should only take 5, instead of 10? Also, I’m guessing the heat of simmering isn’t destroying the Vitamins in any way? That was what I was worried about the most. I just happened to have this same vitamin already & went online to find a recipe for the vit gummies with the liquid vitamins to see if that was the case. (Losing potency with heat) I’m excited I found your recipe! I don’t have the agar agar right now, but I have great lakes gelatin. When I use all of that up I will order the plant based. Also, I already have a bunch of the gummy molds. I wanted to start making my own elderberry gummies because my daughter doesn’t like the syrup. But I bet she would love the gummies. Especially with orange juice, or another juice. Elderberry gummies sound fantastic, and it’s so good for the immune system. 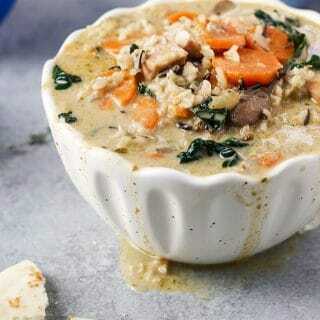 I am glad you liked this recipe and hope they turned out okay for you. I am sitting here for almost 5 minutes and can’t write anything. I would have never ever thought that we could make gummy bears at home. My 6 year old just loves gummy bears and gummy worms and I have a hard time buying something that is vegetarian. We don’t eat meat and hence try to stay away from gelatin as much as we can. 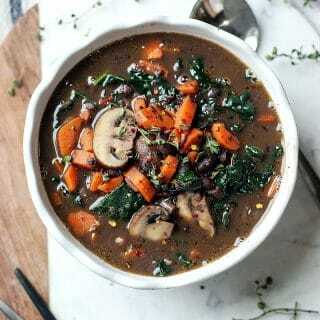 This is my new found treasure and I am definitely making it soon. I have agar agar powder in the pantry and I am going to try without the multivitamins this week. Thats fantastic Sandhya! give it a try without the multivitamin, and make some healthier candy for your little one. Let me know how it turn out for you! Very interesting,I am all for making your own anything over store bought. If my mother agrees to this I am going to make these for my little brother. Haha, it’s so much better, isn’t it? hope you guys enjoy it! What a brilliant recipe!! This is such a clever idea. The bear molding pan is so cute too. Thanks Kim! I think the gummy bears mold make anything looks cute! I am concerned that heating the vitamins might destroy the nutrients. Can you just add the liquid vitamins to the juice/agar agar mixture and not heat the vitamin liquid? The agar agar won’t dissolve properly without it be heated. 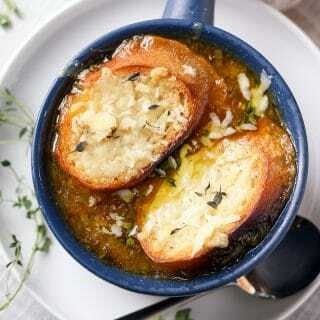 But just to let you know I am going to re-visit this recipe in January and make the necessary changes so it is perfect!